Rapunzel is Sarah Nixon and Mark Chatterton’s 15th Rock ‘n’ roll panto for Liverpool Everyman, and it hits the spot again with their irreverent treatment of a traditional tale. 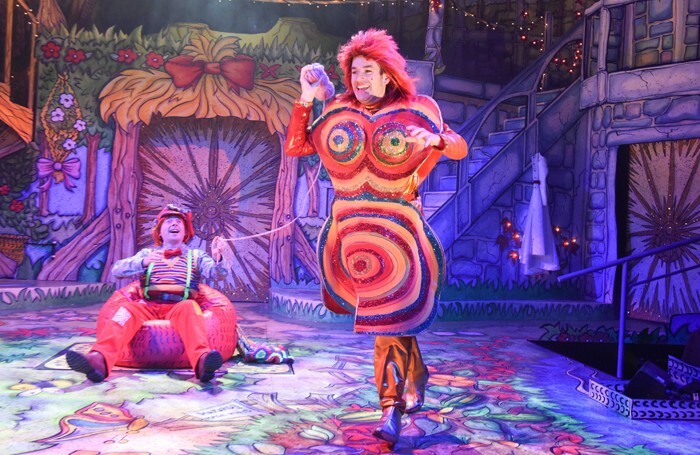 They have created a raucous romp referencing the original story very loosely, while their cunningly balanced text includes some wickedly subtle humour to keep both adults and children laughing. Making welcome returns are regulars Adam Keast and Francis Tucker, whose Horace and Doris share much of the double entendre. Sam Haywood, whose “Hood” is the gallant rescuer to Stephanie Hockley’s appealing Rapunzel, is back for a third time. He made his professional debut here as Aladdin in 2013, and both his performance and voice have grown tremendously in stature. Marianne Benedict is a sultry Poisonella, with Tom Connor as her beguiling henchman and both have commanding presence. The cast of 10 actor-musicians feature some excellent vocal performances, notably from Haywood, Benedict, Hockley and Connor, in a score assembled by Tayo Akinbode from a wide range of popular repertoire. The slightly reduced stage area brings the audience closer to the action and to Dinah England’s psychedelic set and costumes, and audience interaction is excellently judged. The show earns its fourth star for sheer energy and superb comic timing.